Wow. What an intense week the Transforming Nutrition: Ideas, Policy and Outcomes course was. But what a privilege--talking about nutrition for 5 days straight with a great group of participants, convenors and guest speakers. It was a lot of fun. We went through patterns of undernutrition, the causes, consequences, and interventions (direct, agriculture, social protection, women's empowerment and water, sanitation and hygiene and then strategies and tools for building commitment and securing resources. Then we finally worked though a different challenge identified by each of the 4 country teams represented among the participants (Nigeria, Odisha, Ethiopia and Guatemala)--strategies they will take forwards after the course. We had to contend with record heat (no, I'm not kidding) and with a real life example of how double edged the press can be (see here), but neither of these things held us back. I am exhausted, but energised. I am truly inspired by the extraordinary participants--all champions of nutrition. But we need more champions. We plan to hold this course again next July and we will advertise in early 2013. Please consider joining us. But in a moment of weakness 12 months ago I agreed to play such a role in a project conducted by a team from IDS and 3ie. The key questions posed in the research: (1) do policy briefs influence readers? (2) does the presence of an op-ed type commentary within the brief lead to more or less influence? and (3) does it matter if the commetary is assigned to a well known name in the field? So Penelope Beynon and Edoardo Masset from IDS, together with Christelle Chapoy (3ie) and Marie Gaarder (3ie and now NORAD) designed an experiment to try to answer the above questions. The draft report is here (it will be out soon as an IDS-3ie working paper). They created 3 treatments and a control: (1) a policy brief based on the agriculture-nutrition systematic review that I was involved in (Masset et. al. 2011), (2) the same policy brief with an op-ed commentary written by me but assigned to "an IDS Fellow", (3) the same policy brief with an op-ed commentary written by me and labelled as being written by me and (4) a control: a recent policy brief on a topic unrelated to ag-nutrition but relevant to the readership of agriculture-nutrition issues (progress towards MDGs). They constructed a list of about 800 people who agreed to participate in the experiment (from a list of about 75,000 emails) and then randomly assigned the 800 people to the 4 groups (the authors did a power calculation to determine the required sample size). They then conducted questionnaires--would the participant review the message in the brief, share it, seek further information, review their practices, or change practices--immediately afterwards and then one week and 3 months later. They generated 11 outcome variables in all. The study has limitations, which the authors fully acknowledge. First there is some serious self selection from the 75,000 people contacted to the 800 who participated (they did a power calculation that showed that about 800 responses were sufficient to detect a difference if one existed). The 800 were certainly not typical of the 70,000 contacted. Second, the subject of the generic brief probably mattered: it had to be not a million miles away from ag-nutrition links otherwise it would not be of interest to the people recruited, but it had to be distinct enough to be able to create space for the 3 interventions to have an effect. Third, all the outcome variables were self reported, via the internet, with few opportunities to probe answers. Fourth, the results will not be valid for other policy briefs on other topics. So what did they find? There are too many results in the paper to summarise here, so let me focus on the authority (or Haddad) effect. Intended actions at immediate follow up: compared to the other 3 treatments, the authority effect mattered in 2 of the 11 outcome variables (more likely to share the policy brief on and more likely to tell them about it). These differences remained significant at one week, but diminished to 10% significance. Actions at three months follow up: the sharing and telling effects remain strong. So sharing and telling seem to have been affected by the fact that Haddad is on the byline, but the name per se has not changed anyone's practice. This is somewhat reassuring: the authority name has given people an additional reason to share the brief, but people are still making up their own minds about the issues. Maybe this is the most we can (and should) hope for from a policy brief, to generate a buzz, to get the dialogue going, to create a space for the evidence to percolate through. Flawed though the study is, I think it is pathbreaking in that it demonstrates the scope for further study about how to communicate research--this is vital, especially in areas such as nutrition which are so easily neglected. At the Food Justice in India event (see overview paper here) there was a session on how we got to this point (Harsh Mander on “Food from the Courts”) and how we can work with the media to expand and promote food justice. Harsh talked about the debates within the right to food movement on the national Food Security Bill (the Right to Food movement thought it should not only focus on food distribution, but also on food production, while Harsh thought that this would put the potential distributional achievements at risk). He also talked about the affordability issues. He told us about how one TV interviewer aggressively asked him something along the lines of “how long do you expect the middle class to bail out the poor slackers?”. His answer? (1) who is subsidising who? (corporate benefits, failure to offer living wage), (2) the poor are hardworking, they just have not had the same opportunities—more by luck than any failing on their part, (3) it’s a political choice—you can raise taxes via higher rates, better efficiency of collection, more progressive tax regimes and you can cut back on other expenditures and (4) it’s an ethical matter—we need to decide what kind of society we want to be—one that says no matter what it costs to ensure a floor of human dignity we will pay it. Harsh is a powerful communicator. Finally he told us of a mother he met who told him that the hardest thing she had ever had to do as a parent is to teach her children to sleep hungry. These are families that are so desperate they search for undigested grains in cow dung; they search for grains in the stores of rats; they search for grains in the post-harvested fields. The mother said the sooner you teach the children to sleep hungry the easier it gets. Harsh said that we should strive to live in a society where no mother has to teach her children to do this. Others may have heard this many times before-but on first hearing it is strong and effective communication of the problem. During the session on media, I noted that it has taken a story currently in the Indian headlines of a child who fell into an open sewer and died to highlight the terrible state of sanitation in India. The mere existence of the open sewers is not enough, there has to be a “human interest” story for the media to get interested. This is a real challenge for all of us who want to engage the media in the extraordinary but non-sensational death of several thousands of Indian infants a day due to malnutrition. 1. 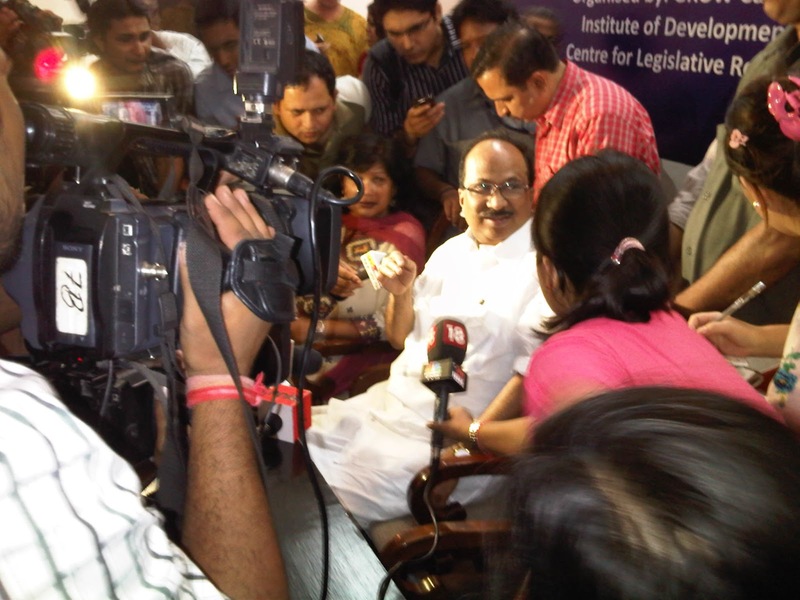 Before the press scrum (see pictures below) around the Minister for Consumer Affairs, Food and Public Distribution, Prof. KV Thomas (one of the Ministers at the centre of the National Food Security Bill) he made some interesting points: (a) the Bill will move from a welfare perspective to a rights based perspective, (b) women as heads of families will be very prominent in the Bill’s implementation, (c) accountability and transparency is vital—he cited social audits and grievance procedures as key, (d) on universalisation he cited “practical” problems (which may be code for “affordability”) such as: can enough food be produced, procured and distributed? 2. The section on eradicating discrimination had some interesting ideas for changing incentives: (a) reward districts that improve inclusivity (Dr RP Mamgain), (b) procure locally (as home grown school feeding initiatives and the World Food Program’s P4P initiative do), and (c) establish Free Prior Informed Consent before any new mining or construction takes place (SC/ST/Adivasis groups tend to lose out the most) from Felix Padel. 3. Establish a Truth and Reconciliation process to address atrocities: if Indians cannot get justice for atrocities how can they get food justice? (Felix Padel). 4. From M. Kumaran, the ignored effects of targeting: (a) the use of language (those above the poverty line are not the “non poor” they are the “less poor”, (b) targeting pits the poor against each other, and (c) the concept of “diluted commitment” (diluted by poor quality services, underfunded programmes and corruption), and (d) a switch in mindset from a default targeting model, being careful about who is included to a default model of universalisation but being careful about who is excluded. 5. The combination of power and poverty that is India and the implications of this for its role in international climate policy negotiations (D. Raghunandan) . India has many of the indicators of a very poor country, and yet its size and growth rates make it part of the “big boys club”. It is straddling two worlds—powerful and poor--so it feels it does not need to do too much to slow emissions because of its need to reduce poverty, and yet the pressure put on India by (a) its aspirations to join the “big boys club” and (b) the small island states who are beginning to feel betrayed by India is forcing it to think about how to slow the growth of emissions. This attempt to “sit on a cleft stick” can be squared by an approach that is agreeable to global targets but with strong conditionalities around technology transfer and rich country behaviour. Finally on the media, Darryl D'Monte noted that it is more interested in the minority of Indians who are trying to lose weight rather than the 600 million who are trying to gain it. Apologies readers (if you are still out there) for the long silence. For the past 3 weeks I have not been able to find the odd hour here and there to contribute to this blog. 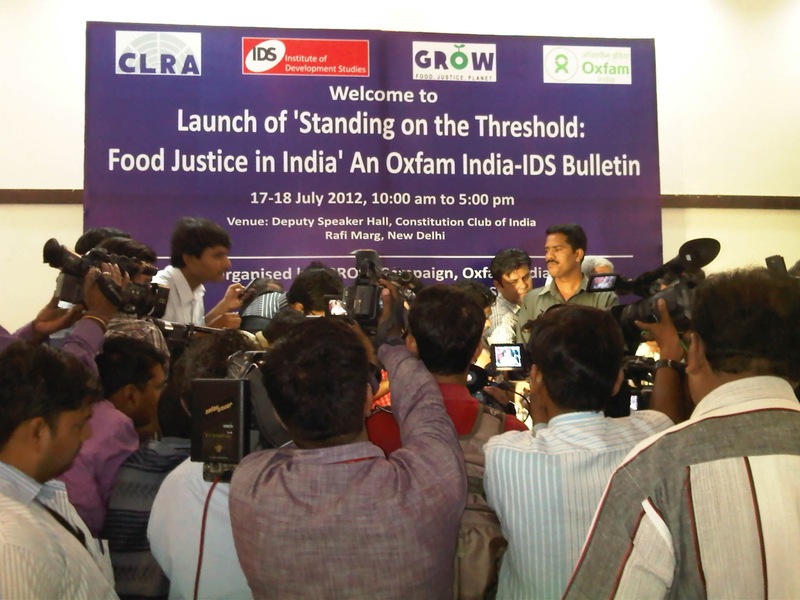 In late June I was busy with the IDS Board, the following week was the IDS Annual Review, the next week was a short holiday and then this week I am in Delhi for the launch of the Oxfam India-IDS Bulletin, Standing on the Threshold: Food Justice in India. 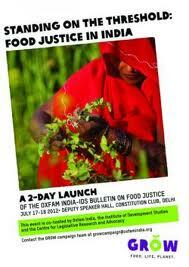 India stands on the threshold of potentially the largest step toward food justice the world has ever seen. “Threshold” because the National Food Security Bill is working its way through parliament with a view to being passed during its current term-period. “Largest” because the Bill will cover approximately 70% of all Indian households, easily the highest proportion of households covered by such a programme. “Justice” because the improved access to food has been catalysed, monitored and ordered by the courts, starting with the Supreme Court. “Potential” because (a) having a Bill on the books is quite different from having it implemented, (b) the Bill is only as good as the programmes it has to work through, and (c) there are many threats to food security that are way beyond the Bill’s remit, climate change being the most significant. “Step torward” because Indian food security and nutrition levels are not being swept up in the tide of GDP per capita growth—they remain rooted to the sea bed. The special IDS Bulletin, co-constructed with Oxfam India, brings together the views and opinions of some of India’s leading practitioner-thinkers on these issues. The Bulletin consists of 15 papers, written by 21 authors (18 of them are from India). The themes are (a) gaining rights, (b) gaining justice and (c) maintaining rights and justice in the face of new threats. The Bulletin kicks off with a series of papers that describe the long struggle to translate a couple of Articles in Indian’s 1948 constitution into rights that courts can rule upon. The Bulletin then focuses on how gaining rights needs to be translated into justice. So make sure the rights bite. For example: stamp out systemic and idiosyncratic discrimination in existing programmes, make the existing programmes work better, introduce accountability and recourse mechanisms and track government commitment to protecting, respecting and fulfilling rights. The final section then talks about the new challenges to food security and respecting and protecting food rights: food price speculation (who to hold to account? ), climate change (who’s rights are more important—current, next or unborn generations?). My powerpoints are here and the links to the Bulletin are here and here. The National Food Security Bill’s progress through parliament has stalled on issues around affordability as inflation and interest rates rise and economic growth slows, the government is getting nervous. NC Saxena, one of the 2 Food Security Commissioners of the Supreme Court, argued in his presentation that the government can manage its financial exposure by varying the subsidy price—what matters to poor consumers is the reliability of access to subsidised food—yes, they care about the price, but more about the security and stability of access. Harsh Mander, the other Food Security Commissioner also noted that India’s tax take to GDP ratio is unusually low and that not enough attention is being given to tax revenue to pay for the NFSB. * the politics of food security. 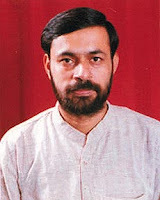 As Prof. Yogendra Yadav argued (see tomorrow’s blog) “the problem of food security and its solution lies in the domain of politics”.